Robert Cameron, born in Chicago Illinois, enlisted in the U.S. Marine Corps at age seventeen. He served with the 1st Marine Division in North China during a later phase of the Chinese Civil War (1946-1947). He attended DePaul University 1948-50, and was called back to service in August 1950. He served inKorea from November 1, 1950 until March 17, 1951. He received his second honorable discharge in June 1951. He returned to school (Northwestern University) and in June 1951 married Patricia Lamb, as planned. Together they raised five sons and four daughters. 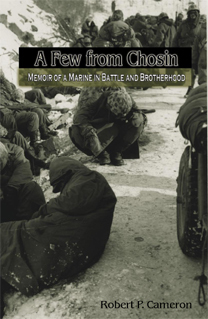 Cameron is a life Member of the 1st Marine Division Association and the How-3-7 Brotherhood and Survivors Group. It is to them, whose namesappear in the back of this book, that this memoir is dedicated.